A R10-million investment by Mpact in its FMCG plastics plant in Pinetown, KZN, will enable the Group to produce a new type of packaging, especially for the dairy industry. The new machinery will offer dairy producers high quality plastic containers of varying sizes for products such as yoghurt. The new equipment is already producing containers for an export customer. Neelin Naidoo (right), MD of the JSE-listed group’s plastics division, says producers in the dairy sector have made it clear in recent times that they are looking for innovative ways to contain costs. “Consumer spending is under strain and food producers say they cannot pass on all cost increases. Fuel, imports and packaging are the main contributors to cost increases of food manufacturers. “We are therefore pleased to be able to introduce new machinery that will produce high quality packaging at a high speed. This will help food producers to contain costs associated with packaging,” says Naidoo. The machine has a high cavitation mould from Glaroform in Switzerland operating at a high-speed cycle time, producing 55 million cups a year. The equipment complies with European safety standards and can accommodate moulds with higher cavitation. Cavitation refers to the number of cups produced in each cycle of the machine as it injects molten plastic into the moulds. Cavitation will differ according to product size. 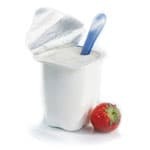 Producing 150ml yoghurt cups, which are relatively small, allows for a higher number of cavities to be used. The IML robot also reduces the risk of contamination by cutting down on unnecessary human contact with the cup, during the manufacturing process. The capabilities of the machinery have been tested and proven, says Paul Visagie, general manager of the Pinetown plant. “Currently this IML system is used to manufacture polypropylene IML cups for an export customer. Four cameras measure each cup ejected from the mould for defects such as label displacement, label over-moulding and rim accuracy. Small print and multiple colours can also be used on labels without compromising the quality. Changes to label artwork are less time-consuming than the more traditional decorating methods. Specialised IML labels with benefits such as temperature regulation and O2 barriers are also available. Various substrates and thicknesses offer a variety of visual effects ranging from a foiled look to pearlised, matt, gloss and metallic finishes. “By keeping the more expensive elements of packaging consistent, one can differentiate brands within the same category by means of a simple label change,” says Visagie. Naidoo says Mpact will continue to invest in its operations and geographic footprint in order to meet the changing needs of customers and to remain cost competitive.